The USA Pans 20 cup Mini-Muffin Pan is constructed of aluminized steel, the material of choice for commercial bakeries. The metal thickness of this pan has been selected to allow for even heat distribution and maximum service life. An important and unique feature of this pan is its corrugated design. Corrugation maximizes the pans strength and prevents warping, denting and other effects of everyday use. No need for messy and unhealthy oil and grease. This pan is coated with Americoat. Americoat is a proprietary silicone coating. It provides a clear, non-stick,non-toxic baking surface, specially formulated for superior baking. It's FDA approved; it does not contain PTFE's or PFOA's. It is not recommended to exceed baking temperature of 400 degrees F. Easy care. To clean, simply wipe clean after use; soap and water are okay to use. It is not recommended that pan be washed in dishwasher because harsh chemicals can cause the non-stick material to breakdown in time. Dry pan completely, after cleaning. USA Pans is the newest line of bakeware developed by American Pan, the world's largest manufacturer of commercial bakeware. Pans are made of 65% recycled steel. Made in Pittsburg, Pennsylvania, USA. Lifetime warranty. 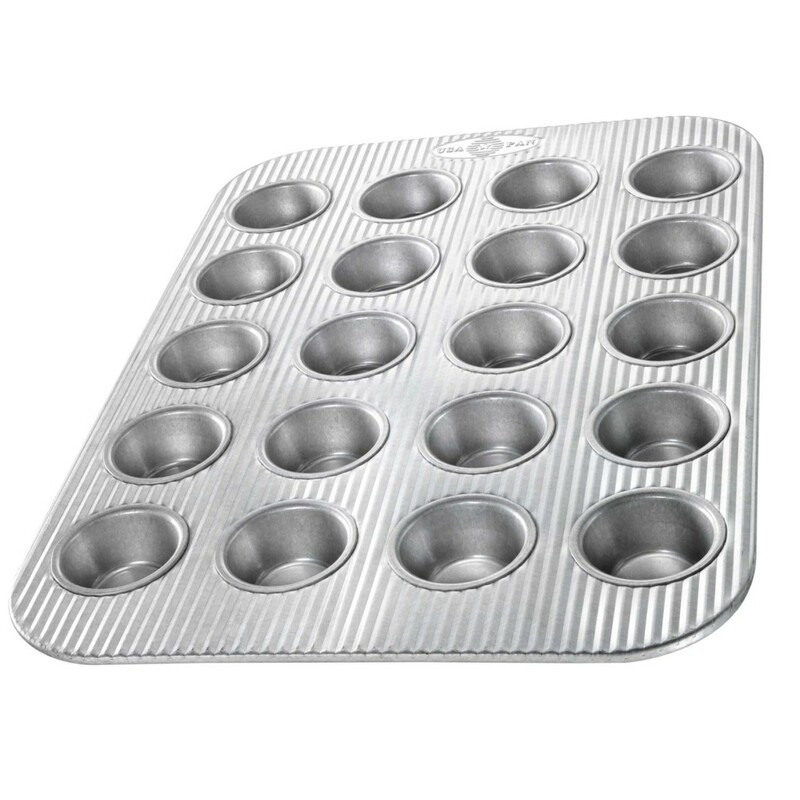 Click the button below to add the USA Pans 20 Cup Mini muffin Pan Aluminized Steel with Americoat to your wish list.